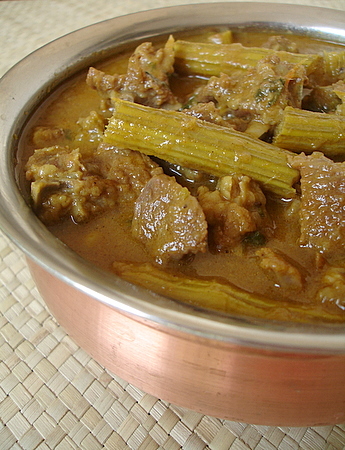 Meat lovers will relish this mutton curry which is cooked in combination with drumsticks. The meat becomes succulent and flavorful from the slow simmering to absorb the spices and the drumsticks give the taste buds a good tingle. 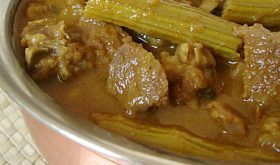 Very easy preparation and makes a good curry with hot rice or rotis. Heat oil in a pressure cooker, add the onions and green chillis and saute for 6-7 mts. Add ginger garlic paste and saute further for another 4 mts. Add the mutton and combine well. Cook on high heat for 7-8 mts, stirring the meat such that is doesn't burn. Add chilli pwd, turmeric pwd, coriander pwd, jeera pwd, poppy seeds pwd and salt, combine. Never had meat and drumstick combination, sounds interesting to me, will definitely try it out, thnx for sharing Sailaja. Hi Sailu! looks delicious and yummy…thanks for sharing dear! a very interesting combination! also, was looking at your blog for some recipes to make at a party this week.. have really loved the chicken balls recipe and plan to make those..
What a lovely healthy recipe. Followed your recipe Religiously and the result was the Excellent. I just have a small request !!!!!! pls help me with the recipe of the indian style Ginger chicken masala. I am just not able to find it anywhere. I learn something new from you all the time! Very nice! Recipe looks yummy. There r no post from u since so many days. Is everything fine with u. Iam bit worried. I plan to visit G U N T U R this weekend; as a foodie can you please guide me on sme culinary stops in this spice town? Must eateries, must visit spice markets??? I never cooked my mamsam with drumsticks. The curry looks very unique to try. Why dear Sailu do you torture me so…? not so much with the mutton but the drumsticks. I have not had that in a decade. Last year when I went to Guyana, I went in search of some but no luck. Now you torture me with this curry. And mutton, love mutton. Hey! one of my fave all-time curries. Thanks for sharing, Sailu. My grandmother had a huge tree in our house (“sojni ki phalli” in Hyderabadi lingo) and I remember eating meat and drumstick curry often in her house. Then, the tree was cut down to extend the house and there was an end of that :(. This looks simply amazing. It reminds me of a dish I make for my Persian husband called Khoresht-e-Karafs which can also be made with lamb. Every time I stop by here you have something wonderful cooking. Thanks. recipe.akanshaz.com/?p=380 someone has copied this recipe and the picture. Just thought to inform you. Really amazing food recipes! i got this website through sakshi.com, first i have to say thank you for sakshi.com, y bcz i may not have got to this site in my life! Add some sweet items too..
and it came out really well. Thanks for it.